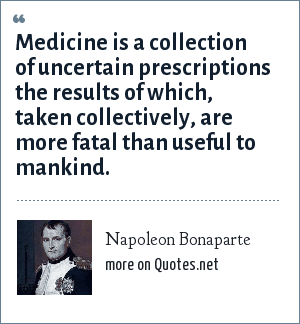 Napoleon Bonaparte: Medicine is a collection of uncertain prescriptions the results of which, taken collectively, are more fatal than useful to mankind. "Napoleon Bonaparte Quotes." Quotes.net. STANDS4 LLC, 2019. Web. 24 Apr. 2019. <https://www.quotes.net/quote/11054>.